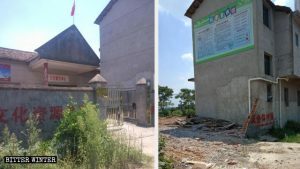 A memorial archway at one of the four sacred mountains of Chinese Buddhism has been forcibly demolished, and the president of the Mount Jiuhua Buddhist Association has been placed under house arrest. 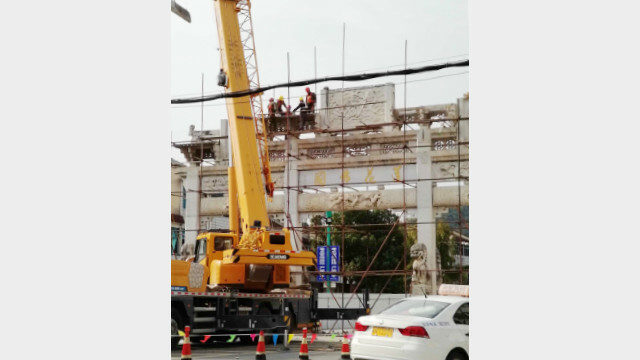 The memorial archway at the entrance of Mount Jiuhua is being forcibly demolished. 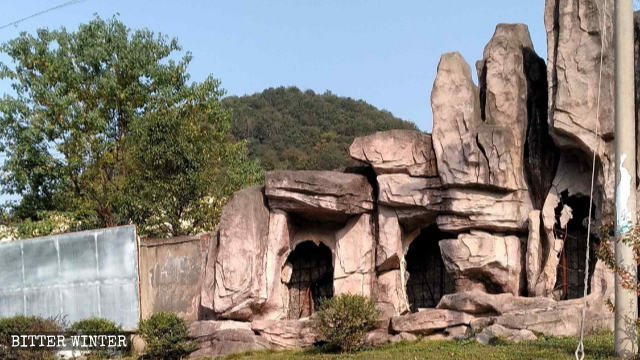 The archway of Mount Jiuhua in Chizhou city’s Qingyang county of the eastern province of Anhui was forcibly demolished on October 19. 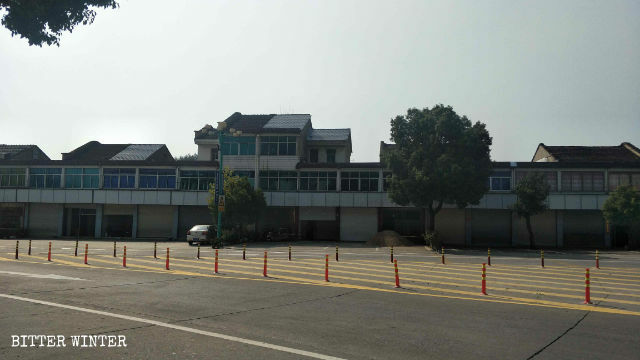 It was built in 1994 after Mr. Ji Lianghua from Hong Kong donated 380,000 RMB (over 55,000 USD) for its construction. 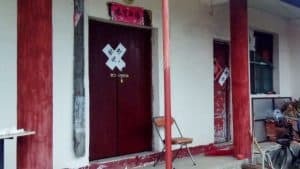 Sources inside the government confirmed that the president of the Mount Jiuhua Buddhist Association had been placed under house arrest at his residence in Baisui Palace, which has also been raided. 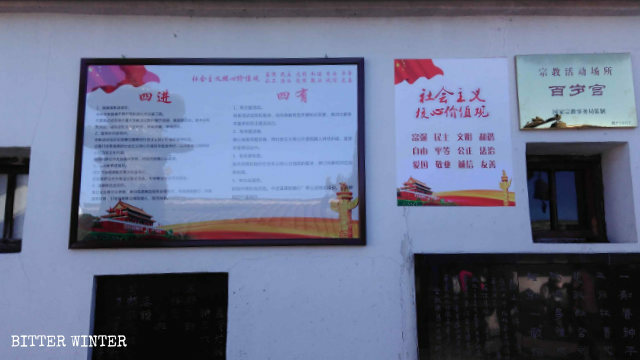 Party slogans are posted on the wall of Baisui Palace. The demolished memorial archway was at the very entrance to Mount Jiuhua. 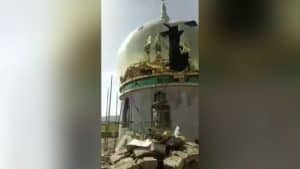 A local Buddhist monk said that its destruction had dealt a blow to Mount Jiuhua’s reputation as a sacred Buddhist site. 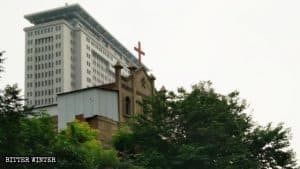 He added that following its “sinicization” policy, the Chinese Communist Party has already hoisted a national flag at every Mount Jiuhua temple, and posters with the “core socialist values” and the new Regulations on Religious Affairs have been posted on the walls of all places of worship. 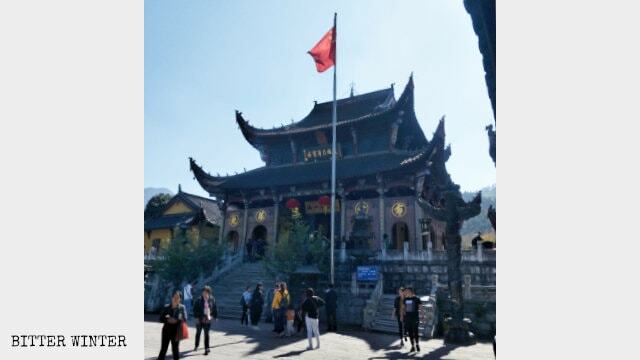 The towering national flag in front of a Buddhist temple. According to the monk, the government has now prohibited the burning of large incense sticks in temples. Each Buddhist worshipper is only allowed to burn three thin incense sticks of the smallest size, and government officials carry out inspections to ensure compliance. 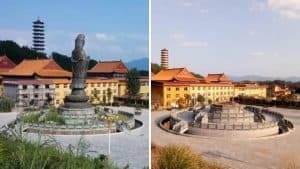 Many monks have already been expelled from the temples on Mount Jiuhua, and the Dabeilou guesthouse in the area has been demolished. A Buddha statue carved in a cave has been smashed to pieces. An empty cave where Buddha statue used to be. 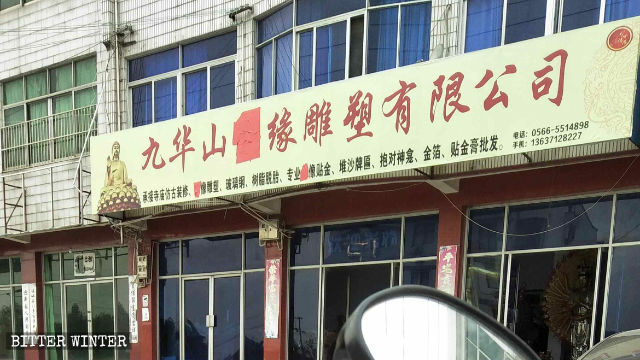 Buddhist incense shops have been closed down. 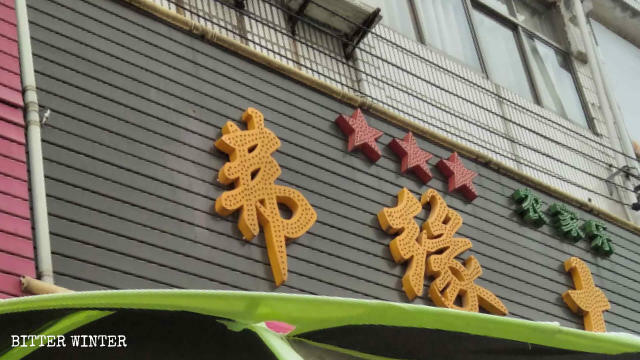 The Chinese character for “Buddha/Buddhism” (Fó) on the shop’s signboard has been covered. 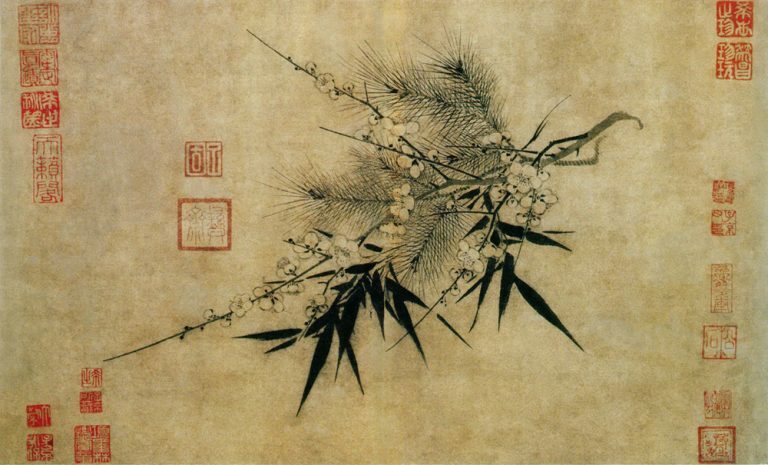 The Chinese character for “Buddha/Buddhism” (Fó) has been removed. The crackdown against Buddhists is being carried out by the bureaus of Public Security and Urban Management. 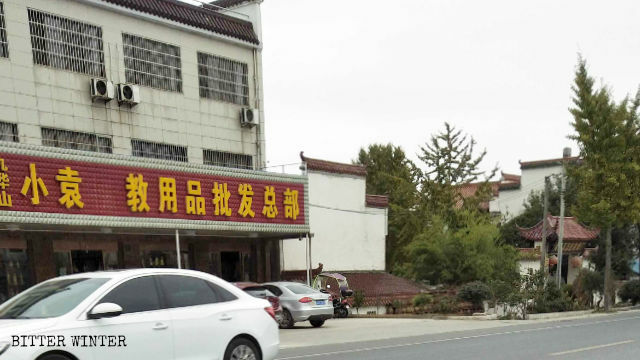 According to recent information, 17 temples in the Guichi district of Anhui’s southern city of Chizhou are facing closure or demolition.